Most electronic circuits will require power to operate and for printed electronics devices to become a commercial success there is a need for a simple printed power supply that will last for the typical lifetime of the product. Printed greeting cards with electronic add-ons are a classic example where the power is needed for a fairly short period of time but these are often powered by thin button cells which are not part of the printing process. Several manufacturers are now providing printable power supplies and I have been keeping an eye on these developments. 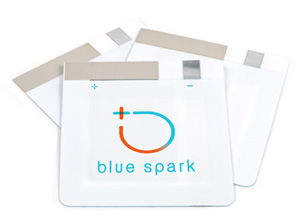 Blue Spark Technologies recently announced an expansion of their manufacturing facilities for flexible carbon zinc batteries to meet the growing demand for printed electronics in commercial and industrial packaging. The full article is here. Back in October 2011 Blue Spark were granted a patent (US8029927) which covers the technology used in their flexible electrochemical cells and their manufacture. A thin printed flexible electrochemical cell, and its method of manufacture, using a “picture frame” structure sealed, for example, with a high moisture and oxygen barrier polymer film and featuring, for example, a printed cathode deposited on an optional, highly conductive carbon printed cathode collector with a printed or a foil strip anode placed adjacent to the cathode. A viscous or gelled electrolyte is dispensed and/or printed in the cell, and a top laminate can then be sealed onto the picture frame. Such a construction could allow the entire cell to be made on a printing press, for example, as well as gives the opportunity to integrate the battery directly with an electronic application, for example. Detailed descriptions cover the construction of the cells, sizes and thickness of the “frames” to contain the electrolyte and typical materials that can be used. Examples of a 14 step process are given and then ways to reduce the steps to a 9 step process for a more cost effective operation. said frame together with said first and second substrate layers defining an inner space that encloses said electrolyte layer and at least portions of said cathode and anode layers. This image from their website gives some idea of the size. If you require more details or need to understand the patent landscape for this technology contact me or add any comments below.